Whomp whomp. There're no Bubble Power She-Ras for sale. 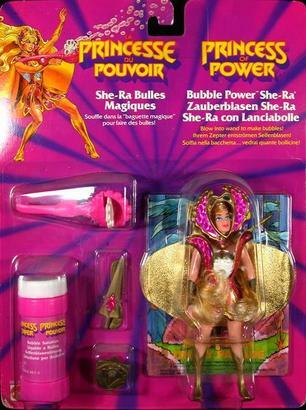 Bubble Power She-Ra has blonde hair, a white suit with a silver gem and gold boots and cuffs. She wears a pink/gold armor, gold cape, head crown, gold shield and gold sword with star sicker. Included is a bubble blower, bubble liquid, a gold comb and the mini comic 'Don't Rain on my Parade'.